The General Dynamics F-111 "Aardvark" is a medium-range interdictor and tactical strike aircraft that also fills the roles of strategic bomber, reconnaissance, and electronic warfare in its various versions. Developed in the 1960s and first entering service in 1967, the United States Air Force (USAF) variants were officially retired by 1998. The Royal Australian Air Force (RAAF) is the sole remaining operator of the F-111. The F-111 pioneered several technologies for production military aircraft including variable-sweep wings, afterburning turbofan engines, and automated terrain following radar for low-level, high-speed flight. Its design was influential, being reflected in later Soviet aircraft such as the Sukhoi Su-24, and some of its advanced features have since become commonplace. During its inception, however, the F-111 suffered a variety of development problems, and several of its intended roles, such as naval interception, failed to materialize. In USAF service the F-111 has been effectively replaced by the F-15E Strike Eagle for medium-range precision strike missions, while the supersonic bomber role has been assumed by the B-1B Lancer. In 2007, the RAAF decided to replace its 21 F-111s in 2010 with 24 F/A-18F Super Hornets. 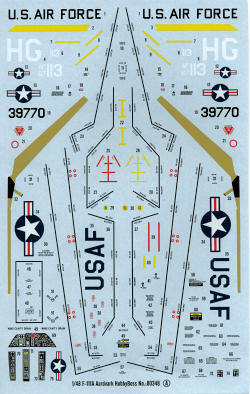 In this scale, the F-111 has been previously kitted by Academy and spawned a number of cheap Chinese copies. There was much to be desired in the fit of the Academy kit and so this new release by Hobby Boss should be well received by those who are looking for a better 1/48 F-111. Starting with the A model makes sense and I'm sure we will see the whole run of variants before Hobby Boss is through. I'm not prescient, but did notice four different main instrument panels on the sprues! The look of the kit reminds me quite a bit of the Hasegawa 1/72 F-111 series, but there are probably only so many ways to mold a kit like this. Like the Hasegawa kit, it is designed to be built with the wings fully forward, so you need to keep that in mind when it comes to shelf space. I didn't see any swept back option. Once one is able to get the box open, a virtual plethora of sprues awaits one's eyes. This is not a bare bones kit by any means and among its features are complete engines, a separate escape pod, a full radar set, deployed flaps and slats for the wings, and the ability to show the canopy sections open or closed. The kit also includes rubber tires and removable panels on the nose section to show off the equipment bay. A most complete set of weapons and stores are also provided that include MERs and TERs, Mk 20 Rockeye cluster bombs, Mk 82 slick 500 lb bombs, ALQ-119, 131 and 87 jamming/ECM pods, AIM-9B Sidewinders and a pair of large fuel tanks. There are also a few other weapons (like JDAMS) that are not appropriate to this version. The bomb racks include separate hold downs. A nice touch is that the upper and lower fuselage halves, clear bits and rubber bits are all contained within a separate box to keep them from damage. 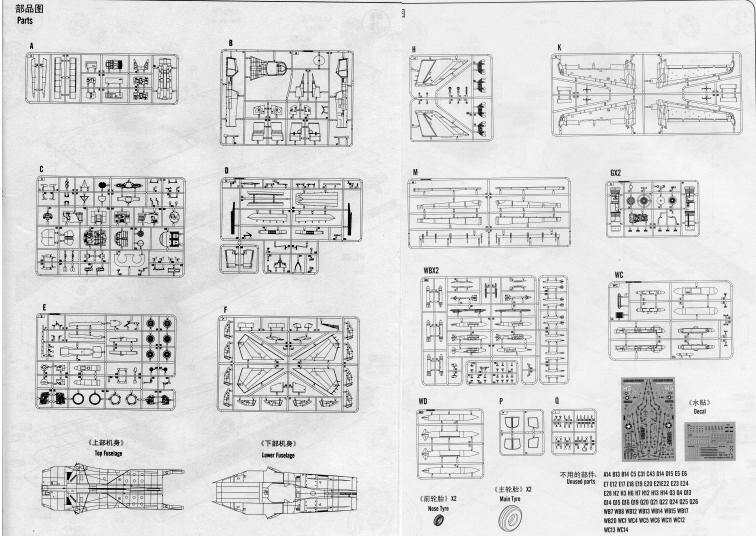 Instructions are typical of Hobby Boss in that all twelve construction steps are well drawn. They also cover both sides of two large folded sheets. A load out diagram is also included that oddly, shows nothing carried on station one. Markings are provided for two aircraft. One is 63-9770, one of the pre-production aircraft painted in Light Gull Grey over White. The other is one of the 474th TFW planes on the F-111s second deployment to Vietnam in 1972-73. It is in the SEA scheme but with a black underside as is appropriate for a plane that was designed to fly mostly at night. The decals are very nicely done and include all the various data markings needed. A separate sheet contains markings for the pods and weapons. If you will notice the image below, the aircraft (which is from the same time period as the kit) does not have the slime lights so you would be best to leave them off. Even though the instrument panel and consoles are nicely detailed, you are given a decal to add to things. 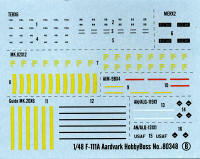 A full color painting and markings instruction sheet is provided and the decals are very nicely printed. I've had good luck with Hobby Boss decals so they should prove no issue. 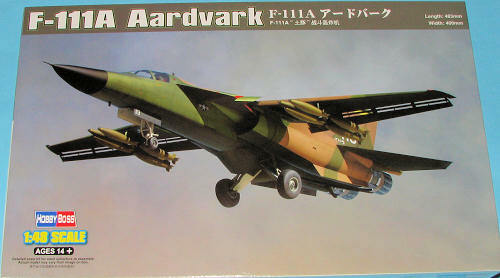 F-111 fans and those who want what is a superbly detailed kit will be very pleased with this one. It is not a weekend build by any stretch, but with all that is included, it is the best detailed F-111 kit on the market. Thanks to Squadron Products for the preview sample. You can find this kit at your local shop or on-line retailer.